Simple Wordpress Themes for 2018 - Feast Design Co.
No one likes spending hours on navigating the nitty-gritty nuances of wordpress, having to fine-tune and tweak themes with complicated code. We’re built on the Genesis framework to simplify your admin work and implement best-practices from the start, so that you don’t have to be a wordpress, database or SEO expert. 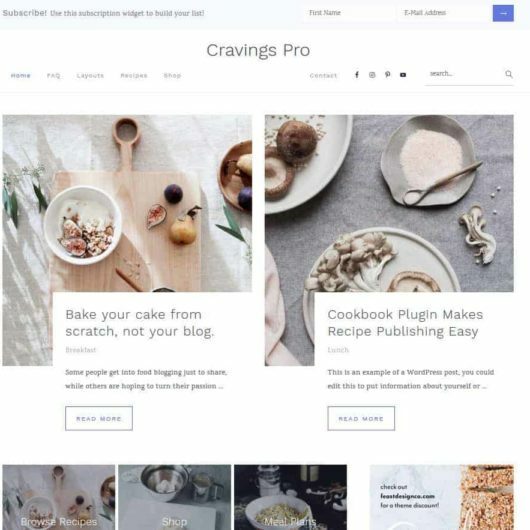 Install any of Foodie Pro, Cook’d Pro or Brunch Pro themes and start publishing right away with a professionally designed layout that you can be proud of. We integrate best-practices as defaults, letting you get up and running quickly and working on your blog content. This is important because little design mistakes can affect your user experience, which in turn hurts important metrics in the eyes of search engines. While the themes work perfect out-of-the-box, we’ve added simple customization options to your admin, allowing you to adjust fonts, headers, and sidebars and make your blog yours without diving into code. All of our themes are mobile-ready, making you look great whether your visitors are using a wide-screen desktop or are finding your recipes on their mobile device while looking up recipes at the grocery store. Your content will be delivered first and foremost, without you having to touch a line of code. Built-in compatibility with image caching, page speed optimizations and a clean layout helps enhance your user experience. This decreases bounce rates, increase time on site and helps show search engines you’re there for your visitors. Simple doesn’t mean basic. It means refined. We offer elegant, simplified layouts that focuses on what’s important: your content. Those beautifully structured and edited photographs you slaved over can finally get the attention they deserve, showing off your work and enticing readers to dig into your posts. And once they get to the posts? They’ll find them easy to read, regardless of what device their on. Reducing visual clutter with a simple blog design makes your call to actions (newsletter signup, navigation) more prominent, driving conversions and helping you build your business. I like your themes but I’m not a food blogger, can I use them anyway? Absolutely! All the themes are fully customizable. 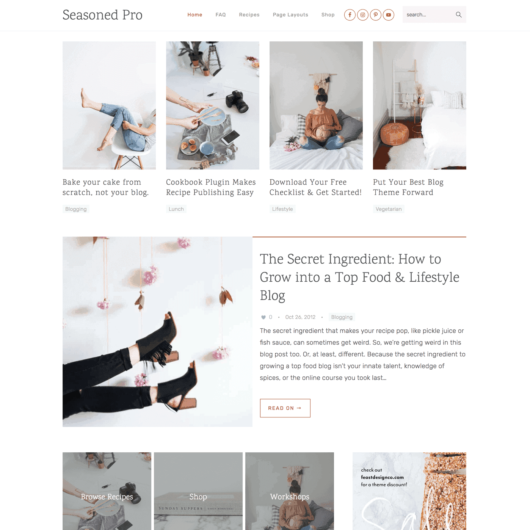 Whether you’re a designer, travel blogger, finance pro or photographer, our simple themes bring your content to the forefront and offer a professional layout. Note: Currently, the Cook’d Pro theme does not have customize options for Typography or Colors, but these are fully customizable with standard CSS. Can I customize your themes? Yes! All our themes are designed with WordPress best practices in mind, making them easily editable and customizable to your heart’s content. We have a number of great font, spacing, layout and color customization options available in the Admin -> Appearance -> Customize panel.